This entry was posted in Death Announcement, English Newspaper, Illustration, Religion and tagged Ann Eliza Clark Gulick, Benjamin Wyman Parker, Charles McEwen Hyde, Enoch S. Timoteo, Enoch Semaia Timoteo, Enoka Semaia Timoteo, Hawaiian Mission Children's Society, Kaumakapili Church, Kula Hanai o Waialua, Liliuokalani Protestant Church, Mary Kealohapauole Timoteo, Mission Houses Museum, Orramel H. Gulick, Waialua Boarding School, Waialua Hawaiian Church by nupepa. Bookmark the permalink. mahalo for this. Her husband, Rev. Enoch Semaia Timoteo was an anomaly amidst the turbulent times 1893-1900. He refused to take the oath of allegiance to the PG and was a strong Royalist throughout but yet was retained by the Hawaiian Board in his position because he was a very strong bridge between factions that were at odds. 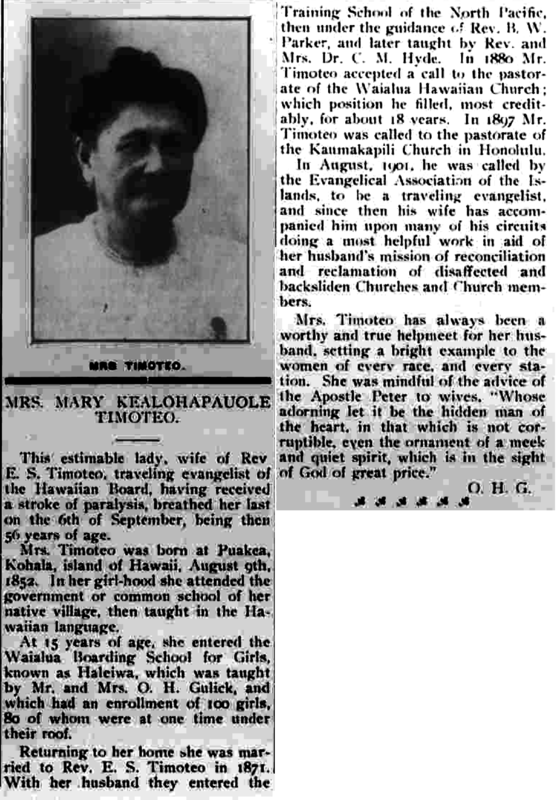 He presided over the funeral of Iosepa Nāwahī and when Queen Liliʻuokalani was released from house arrest she went and stayed with Mr. and Mrs. Timoteo for two weeks. He is buried at Waineʻe Cemetery in Lāhainā where he brought that church back together after a decided split. Is there more info on this story please help. Thanks.